At the start of 2015, Divio was given the possibility to extend their working relationship with Zürcher Kantonalbank and as with previous collaborations also this project was confidential. The key difference of this partnership, in comparison to previous projects, was that a brand new CI/CD was introduced and it was necessary to take that into consideration for the new website design and development. The goal of this project was to display the newly renovated offices in Bahnhofstrasse 9 that would be made available to the public of Zurich in a fresh and welcoming manner. There would be a feel of Zürcher Kantonalbank throughout the website with a modern, clean anduncomplicated touch. The website should also enable all users a fast and easy transition through the registration and booking process. Through every step of the design process, and working closely with the marketing and branding department at Zürcher Kantonalbank, the style of the website was defined and reaffirmed. Through a series of workshops, the personas for the co-working space were understood, this ensured that the registration and booking was effortless. Further workshops with the backend partner company would further establish the possibilities of the frontend integration. 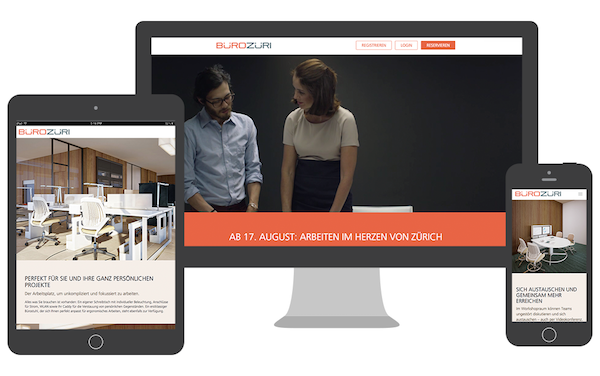 The frontend of the website was implemented in a similar approach to all previous Zürcher Kantonalbank projects with the newest standards according to Bootstrap, the most known framework of HTML, CSS and JS. This enabled us to combine the simple design with special effects as the video in the header and a parallax effect whilst maintaining responsiveness for all devices. The frontend development process also includes sophisticated automated testing. Overall we were able to deliver what our long time client Zürcher Kantonalbank needed in the time and budget communicated at the beginning of the project.